This summer, you’ll be in and out of your garage to pull out sports equipment, gear for a trip to the beach, camping supplies, the lawnmower, bikes and much more. You’ll save time and frustration if you get your garage organized so you can grab and go—and have more time for fun. That way, everything has its place, and your family will know where to put away items. 2. Use open shelves and clear bins so you can see everything you have easily, which means you’ll save time finding the items you need. 3. Store frequently used items near the garage door, such as bikes. 4. Larger items like the lawn mower can be stored in the corners of your garage so they won’t get bumped by your car (and vice versa). 6. Reuse and repurpose items. A classic “reuse” is to use an old rake head as hooks. Also, jars with screw-top lids that help organize small items like nails, screws, and other odds and ends. 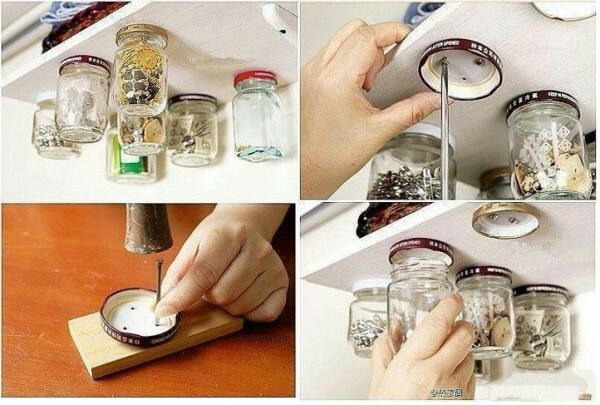 Attach the jar lids to the bottom of a shelf, then screw in the jars to the lids. You now have storage that saves space and keeps everything visible. 7. Corral sports balls with bungee cords for easy access and easy storage. 8. Use items from other rooms for storage. If you’re renovating your kitchen and replacing the cabinets, you can repurpose the old cabinets in your garage for covered storage. Also, check donation centers like Goodwill or Salvation Army or tag sales for cabinets and old desks for the same purpose.